A belt grinder with a flat platen is great, but versatility rules in my shop. Thus a way to shape inside curves with any grit I want is priority. After taking a look at some designs, I came up with something that works and doesn't cost an arm and a leg. The core of this build is a drum sanding kit. 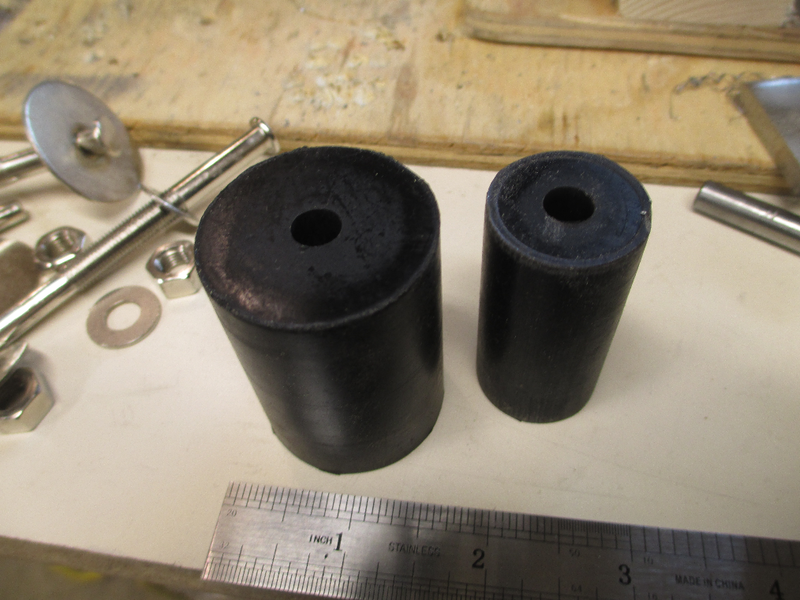 These rubber drums are 2" long and various diameters. The kit that I bought (Big Horn) has 1/2", 3/4", 1" and 1-1/2" diameters. 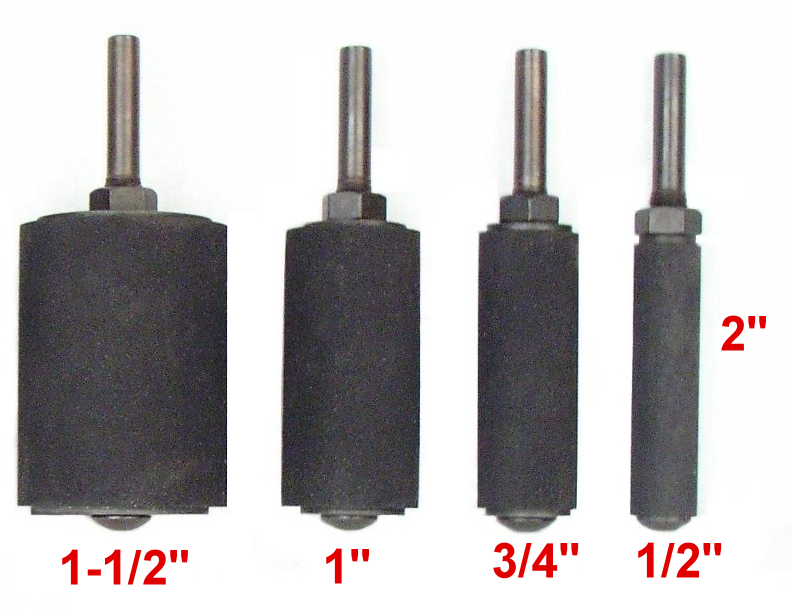 The shanks are 1/4" in diameter, but a A 5/16" rod would make a much better fit inside the rubber. Remove the shafts and you get some very nice 2" rubber drums. For bearings I chose 1603s as they have a 5/16" inside diameter. The outside diameter is 7/8". Finding a piece of pipe that has a 7/8" inside diameter was a bit of a trick, but I managed to re-purpose a furniture leg from Ikea. It is nickel plated so I stripped the plating off with the sander. The fit is not tight, but within a few thousandths. For the frame I have some 1/4" bar stock. I cut it into two 6" pieces. After cutting a section off the end of the pipe, I cut it in half. This leaves us with two semi circles. I aligned the edge of the bearing with the end of the frame . Quick clamp to hold while welding. This is thin wall tubing, so low heat is in order. Once the semi circles are welded I ground them down to about 3/8". Clamped and drilled. The aim is align the half circles, clamp and drill. I marked them at 1/2" and then 4-1/2" in from the end. The finished holes are 5/16". The 1-1/2" angle is cut to 5-3/4" and drilled to match the holes on the frame pieces. I wanted to keep the wheel as forward as possible so I drilled the front hole 1/2" from the end. The marks on the bottom are for mounting. I'll make these 5/16 x 5/8" slots. This is a test fit. I cut the spacers at 3-1/4". The 5/16" ready-rod was cut to 4 -1/2" long and the thread finished on the ends. 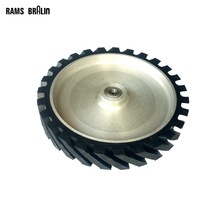 The wheels consist of three parts. The shaft, the rubber and the bearings. For a shaft, I used some 5/16" SS 304 round stock cut to 3-3/16" in length for the shaft. Once cut I trued and chamfered the ends. A 1603-Z bearing is pressed on one end (I used a vise and a 3/8" nut to protect the bearing) I then applied some contact cement to the middle of the rod and pressed the rubber on. Right away I pressed the second bearing on. The rubber cement takes a few minutes to set, so get the rubber as precisely between the two bearings immediately after the second bearing is on. Wipe off excess cement that squeezes out the ends of the rubber. Once the cement sets the wheel is ready to use. Repeat this process for the different sizes. Always take care not to crush the bearing when pressing them on the shaft. I let the contact cement dry overnight and so far there have been no problems. Of course you'll need to make sure they are running true. Frame alignment is important. I will note here that the 1/2" diameter drum was pretty messed up from use on my drill press. I have another kit coming so I can make a full set. The last step is to align the frame assembly. You will need to adjust the two mounting bolts to get the wheels to run as square as possible. It was fairly quick for me. I had to take the belt off, loosen, adjust and re-tighten. Once it's running true, you shouldn't have to adjust it. It must be noted that these little wheels run at incredible RPMs. In fact, on my grinder the little 1/2" wheel will be eight times the drive wheel RPM. Figure 3500 x 8 and you'll get the idea. You MUST run them slower. If you have a VFD, something like 1000 RPM at the drive wheel would be okay. If you use pulleys for speed adjustment, use the slowest speed or the bearings might die a premature death. Best of luck in all your projects! POST COMMENT: I've had problems with the rubber staying centre. I used two large (14") cable ties on either side of the rubber and cinched them tight. Clip the excess and the rubber has no place to go. Cheers! December 21, 2014. Terrific set of tutorials on grinders. Thank you so much for taking the time. Thank you for the kind words Carl. I am happy that someone finds this useful. Fascinating site, thanks for the DIY belt sander plans.....I'm building one. The platen design is a bit foggy for me.....how the 2" angle and 1/4" spacer go together with the wheel position......do you have any closer pictures of it? What are you using for the platen surface behind the belt? I put the 1/4" plate to space the 2" angle to the right from the main mounting plate. This gets the angle (which is exactly the same width as the belt) to line up. I run the belt directly on the angle, although I know it will have to be replaced one day. Maybe this image will help. You can see the mounting plate (yellow) and then the 1/4" spacer, the angle is barely visible behind the belt. VERY NICE, BUT ARE YOU MAKING THIS INTO A 3 POINT BELT SANDER BY DOING THIS. NOT MANY PICTURES, BUT I THINK THAT WHAT IT IS. SO BOTTOM LINE IS THE IT IS EITHER OR, 3 OR 4 WHEELS. Yes, when this attachment is used there are only 3 wheels. The drive wheel, the tracking wheel and the small wheel at the front(this attachment). Can you post the link for the place in which you bought the rubber wheels from? Thank you for all that you share. I am currently building a DIY 2x72 grinder. All this information is very much appreciated. It is nice that I work as a toolmaker and can implement these ideas. How are the bearings "pressed on"? Every bearing I've ever used with a 5/16 ID just slid on and off of a 5/16 shaft. They're arent tight. Any tips? Hello again I made a small dia. Wheel fixture aND can't seem to get it to run in the middle of the roller any ideas? If the belt wants to track to one side, try shimming one of the bolts that holds the frame to the arm. OR loosen the two bolts and see if you can rotate the frame. 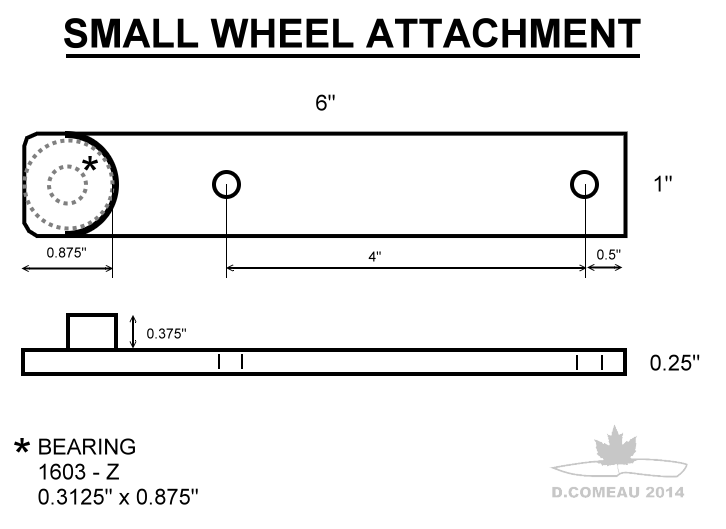 The small wheel has to be 90° to the belt path. If you need a little more wiggle room, you can enlarge the bolt holes in the frame, give the frame a twist and tighten down the bolts. It may only be off by a fraction of a degree, but you can dial it in. Great idea on sourcing the rubber drums. One concern that I'd have is how round they are and whether they'll vibrate at high RPM. Did you have any problem with that? Once I saw this I started looking around for other sources of drums; supergrit.com has them up to 3" dia." You can buy precision ground shaft from McMaster, and/or use Loctite bearing retaining compound. They are pretty soft (maybe Duro 50 or so) and they conform to the belt well. No problems at higher speeds. However, you want to keep the motor speed down as you can easily get the 1/2" wheel going 28,000 RPM. I have a VFD to keep the speed down. According to the bearing life calculator at pacamor.com/technical/lifeloadcalculator.php , the 608-2RS skate bearings I'm using will last 5400 hr at 10k rpm, using 100 lb load (belt tension plus user-applied force). Is it compulsory to use a Sanding drum? Or can we make the small wheel on a lathe, similar to the tracking wheel you made for the original grinder? Nothing is compulsory. LOL The sanding drums are an inexpensive way to get some rubber in different sizes. I find the steel wheels to be very firm and jarring with J flex belts, especially at the seam. The rubber is softer and seems more responsive to changes in applied pressure. Excelente Dan, gracias por tu tiempo y por trasmitir tu conocimiento y experiencia. If its hard to find 7/8 tubing, I know you can buy more than you need at a hefty price. Why not take 2 3/4 washers ,Id 13/16 , weld and drill them to 7/8 diameter? Then grind the sides. 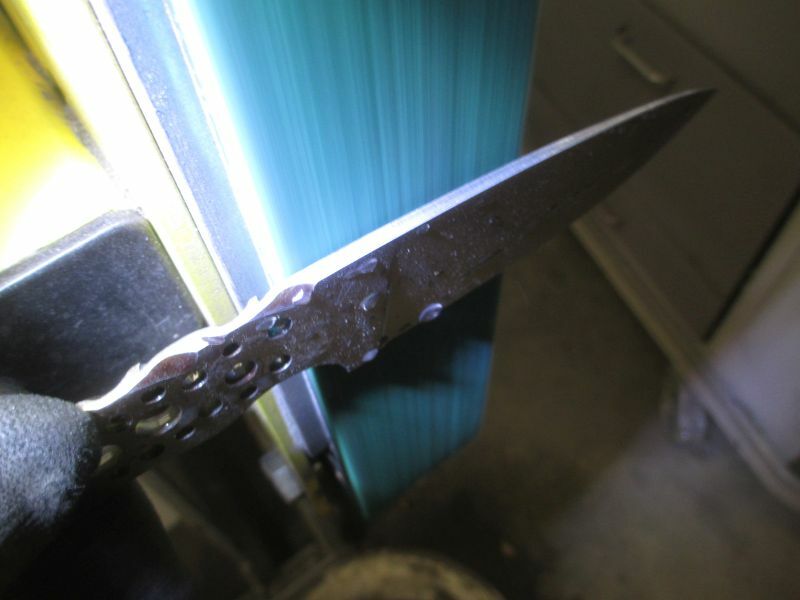 Then cut them andd reweld them?